It is nearly travel season and if you’re reading this you’re probably traveling with an infant or toddler, which brings its own set of challenges; flying the stroller friendly skies. 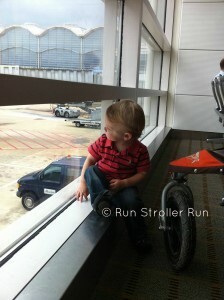 We’re here to focus on a big one: traveling via air with a jogging stroller. The stroller can usually be checked at the gate. Check with your airline if it is not listed below. Most airlines will allow an umbrella stroller as a carry on, space permitting. Most airlines check the stroller free of charge as long as the child is traveling with you, but please check the website or call the reservations number to verify before traveling. The stroller must fold down/collapse (strollers that do not collapse must be checked at the ticket counter and may incur a baggage fee). The stroller must be bagged and tagged (we recommend tagging inside and out). Label it with your name everywhere; like they tell you when you bring your toddler to preschool or day care, Label, Label, Label. The airline is not responsible for damage to the stroller and damage waiver coverage cannot be purchased. 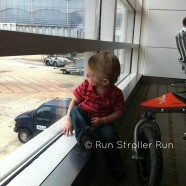 You may bring a stroller to the gate for ease of travel through the airport. The stroller may be gate checked just before boarding the plane and will be returned to the aircraft jet way upon arrival at your destination. Car seats and strollers may be checked free of charge; any other items are subject to standard baggage fees (i.e., portable crib, high chair, etc.). For more information, here is AirTran’s policy. Car seats and strollers can be checked as baggage at no additional charge. If the car seat or stroller is needed in the airport, you can check it at the gate. Infants traveling on a purchased ticket should have a proper child restraint. For more information, here is Alaska Airlines policy. Strollers that are large, non-collapsible or over 20 lbs. must be checked at the ticket counter. Strongly discouraged to avoid damage. May not be carried on the aircraft or checked at the gate; No strollers of any size are permitted as carry-on baggage. For more information, here is American Airlines policy. For more information, here is Delta Airlines policy. For more information, here is Frontier Airlines policy. You may check in your standard collapsible stroller at the gate or at the check-in counter free of charge when accompanied by a ticketed adult passenger and being used by a traveling child. If you have a large stroller we recommend that you check it at the ticket counter. Strollers over 50lbs and non-collapsible strollers must be checked at the ticket counter and will be returned to you at baggage claim. For more information, here is Hawaiian Airlines policy. Note: Please be aware that strollers are not covered for damage if checked. JetBlue assumes no liability for loss, damage or delay per the Contract of Carriage Section 19. For more information, here is Jet Blue Airways policy. Customers traveling with children will be allowed to check one stroller and one Child Restraint System (CRS) or car seat per child without charge. This is in addition to the regular free baggage allowance. The stroller and CRS or car seat allowance applies to any type of stroller (umbrella, full size, jogging stroller, etc.) and CRS or car seat. The Customer may check the stroller and CRS or car seat at the curb, ticket counter, or gate. Southwest Airlines will not assume liability for damage to strollers, CRSs or car seats. Each should be tagged as conditionally accepted and placed in a plastic bag. For more information, here is Southwest Airlines policy. United accepts one stroller or one car seat in addition to a customer’s baggage allowance. When checked as baggage, all oversize and overweight charges will apply. First and second bag fees do not apply to either a stroller or a car seat. United is not liable for damage to strollers. Excess Valuation may not be purchased for strollers. Note: If you are traveling with a stroller and a car seat in addition to the baggage allowance, only one of these items is carried free of charge. For more information, here is United Airlines policy. For more information, here is US Airways policy. We do not allow strollers in the cabin of the aircraft but you may check strollers plane side at the boarding gate for no additional charge. We will do our best to keep your stroller damage free however; Virgin America will not assume liability of responsibility for fragile or unsuitably packaged items such as strollers. Airline policies are subject to change without notice. Please contact your carrier prior to your travel date to confirm the policy before you show up to keep from being surprised on your day of travel. For more information, here is Virgin America’s policy. If you have feedback on regulations that are stated or unstated that we do not have listed above, please provide us your feedback on flying the stroller friendly skies. Cheryl Rushing is a former insurance agent and couch potato. In 2012 her life changed radically when she became a stay at home mom and found herself chasing after a very active little girl. Cheryl never considered herself to be much of an athlete, but she began running in 2013 as a way to alleviate both her inertness and her boredom. Weight loss and energy followed. When Cheryl isn’t running (or running after Penny) she is a virtual assistant for Run Stroller Run and a freelance writer. She can be contacted at cheryl@runstrollerrun.com.